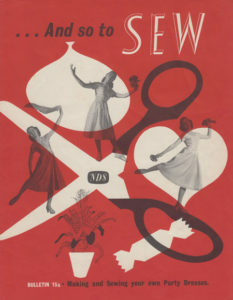 This week “And So To Sew’ and “And So To Embroider” feature girls’s party dresses and ideas for the sewing classroom. 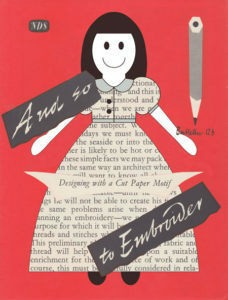 This week’s “And So To Sew” bulletin 15a is a special one with two full patterns for sewing vintage party dresses for girls. 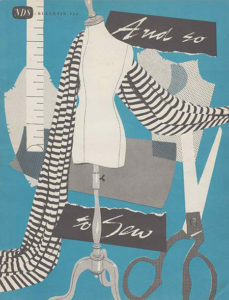 Sized to fit a 30 to 32 inch bust and 24 to 26 inch waist, they’ll increase your sewing skills and your mid century wardrobe. 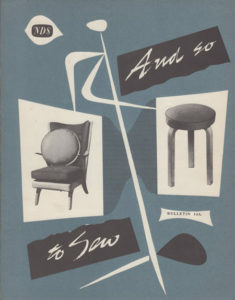 “And So To Embroider” bulletin 15b concentrates on the sewing classroom with tips and projects that would suit many home sewing studios. Including display boards, decorative wall storage for your favourite patterns and booklets, and how to set up an attractive, private fitting room in a public space. 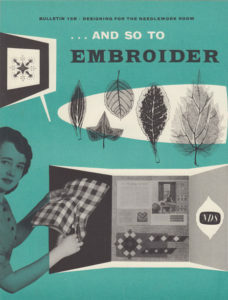 Next week features one of my favourite “And So To Embroider” bulletins. If you’d like to find out what it is, don’t forget to subscribe to the site (on the left for desktop, underneath the post for tablet and mobile), and you’ll receive an email whenever I post new content. This week I bring you And So To Sew and And So To Embroider, bulletins 14a and b, with more sewing for the home. And So To Sew bulletin 14a includes cushions and loose covers of many types. Gusseted and flat cushions, two types of piping, removable covers for cushions and furnishing, and more. 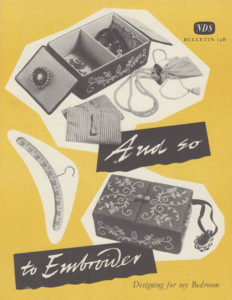 And So To Embroider 14b includes projects for your 1950’s bedroom and a few new stitches. 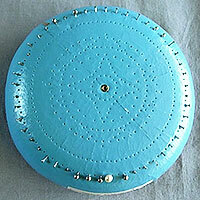 Embroidered jewellery boxes, coat hangers, dressing table mats and a wall pocket. New stitches this week are Maltese cross (aka Gujrati stitch), and interlaced herringbone. I’ve included modern video and photo tutorials for these, for anyone who learns best by demonstration (like me). I hope you’re enjoying these series. If you’d like to keep notified, don’t forget to subscribe to the site so you can receive an email for every new download, pattern or project. This week’s installments of “And So To Sew” and “And So To Embroider” are all about giving your home a little love. 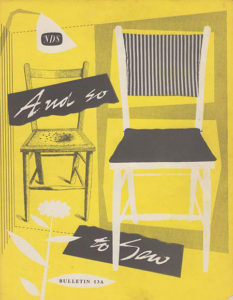 And So To Sew bulletin 13a is all about soft and hard furnishings with instructions to make a bedspread with frill or pleats, pillows, fancy up your dressing table with a skirt, a wall pocket for all your bits and pieces and so much more. And So To Embroider bulletin 13b teaches you how to design and liven up your curtains and cushions with embroidery and clever self made fabric trims. From box pleated trims to a clever folded triangular edging that can be used on a range of different projects (I think it would be really cute on the bottom of a little’s girl’s skirt). This week marks almost the halfway point for our And So To Sew series, and a third of the way through And So To Embroider. I hope you’re enjoying them as much as I do. 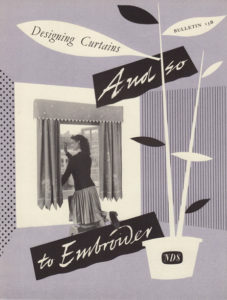 If you’d like to check out the rest of the series that I have uploaded so far, plus a large range on vintage embroidery and sewing books, check out the whole collection on the “Vintage Embroidery and Sewing Books” page. And don’t forget to come back next week for more!